Even in this digitial age where a good deal of my time is spent online looking at pretty images, I still enjoy flipping through the glossy pages of a beautiful magazine. I have a few subscriptions that I still take, but for whatever reason many times I don't get around to looking at an issue for several months after it's arrived in my mailbox. That was the case with this issue of House Beautiful from May of last year, which I didn't get around to fully flipping through until probably November. 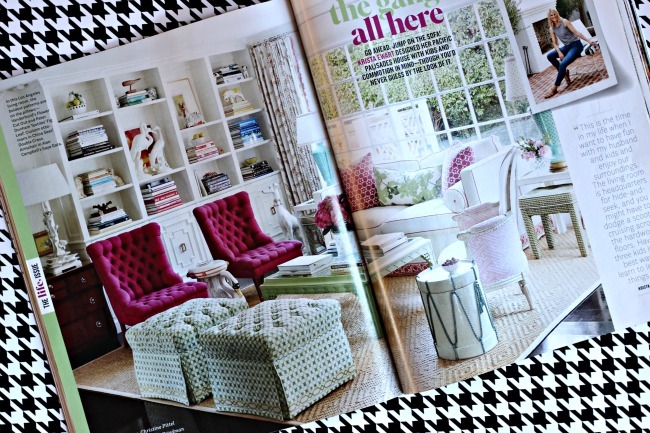 I thought it was an exceptionally good issue, but one home tour sucked me right in. 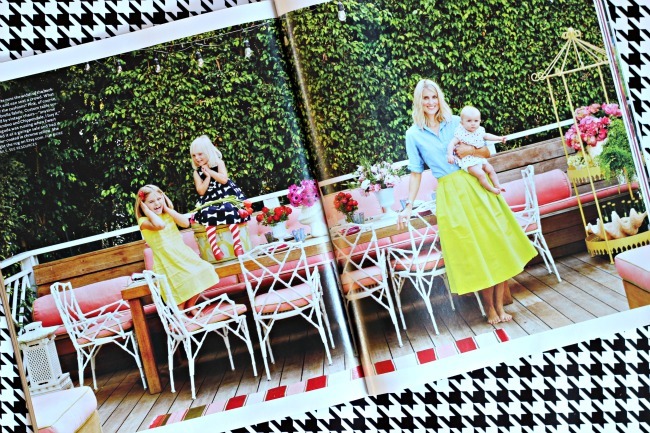 I pick up my copy every time it catches my eye and just study the pages from this perfectly collected, styled, colorful, grown up yet kid friendly home. 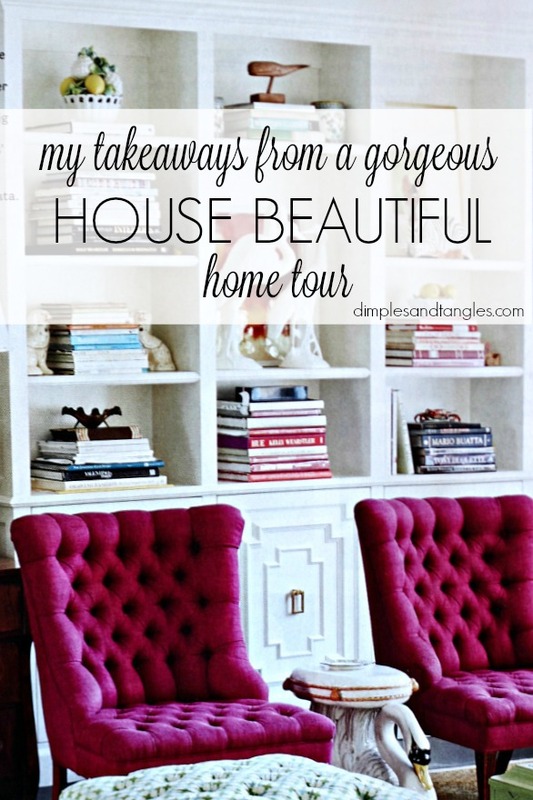 Today, in my amateur decorator opinion, I thought I'd share some of the things I love about Krista Ewart's home. 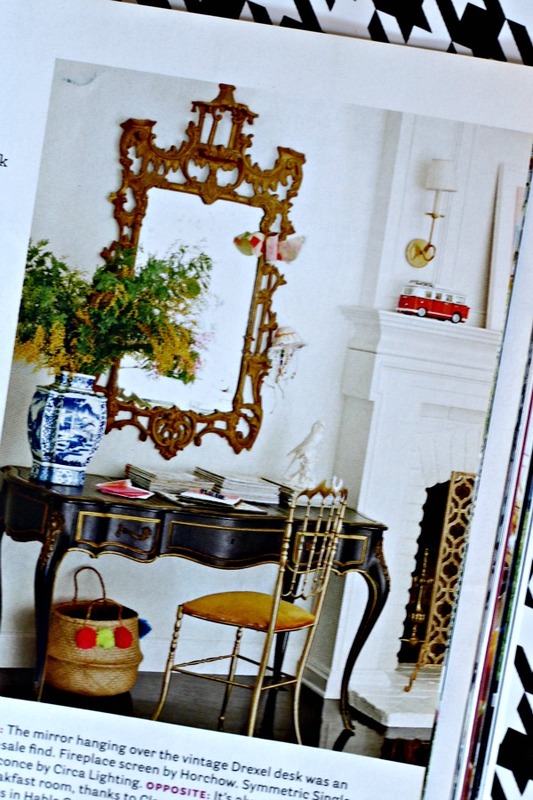 Living Room Takeaways: One thought to start with, I love the furniture arrangement in this room! My living room furniture actually has a similar arrangement right now and it works so well for our family, as well as making it easy for conversations when we have guests over. Painted Coffee Table- I have a new-to-me coffee table waiting in the wings for a makeover one of these days, and I'm trying to decide what to do with it. 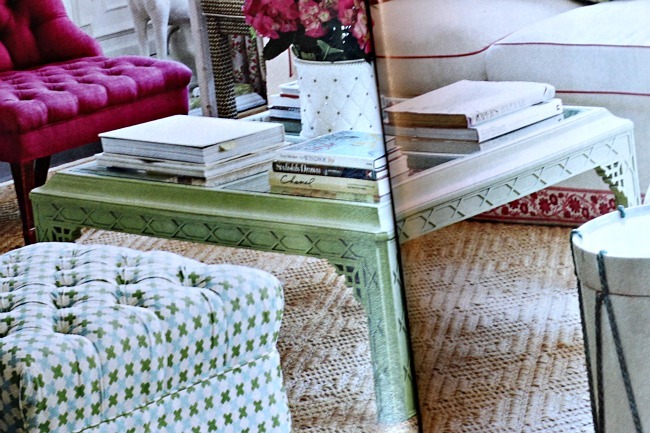 The article explains that Krista painted the finish, choosing this cheery green rather than it's original white. Granted, the details on this one are special and it was probably a high end piece to start with, but I see glass top tables that are similar enough to this one all the time on Craigslist that would be instantly updated with a fresh coat of paint. 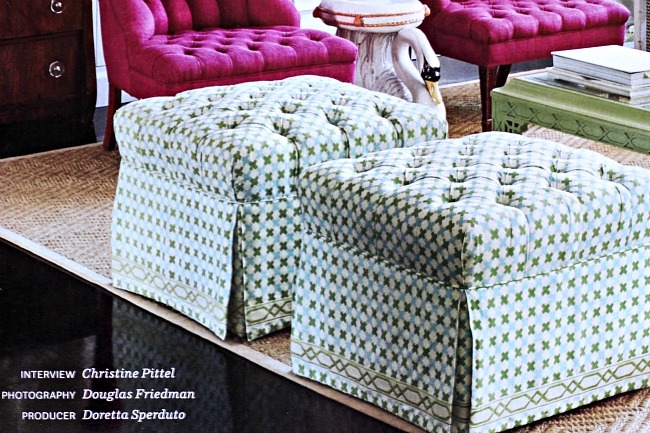 Upholstered Stools: I have my own set (actually 2, I'm a sucker for a pair of ottomans! ), and although I removed the ribbon trim that I originally added to mine, I love the patterned trim along the bottom. It's a nice detail that complements the pattern of the fabric, and I've got an eye out for a pretty pattern to add back to mine. Bookshelf Takeaway: Store books horizontally rather than vertically. This arrangement hints at more of a display look rather than a library look. I'm also filing away the idea of that gorgeous molding and centered hardware on the cabinet door for future reference. This piece is in the corner of the living room, under the stairwell. While the wood finish lends a traditional look, the clear knobs modernize the piece a bit. 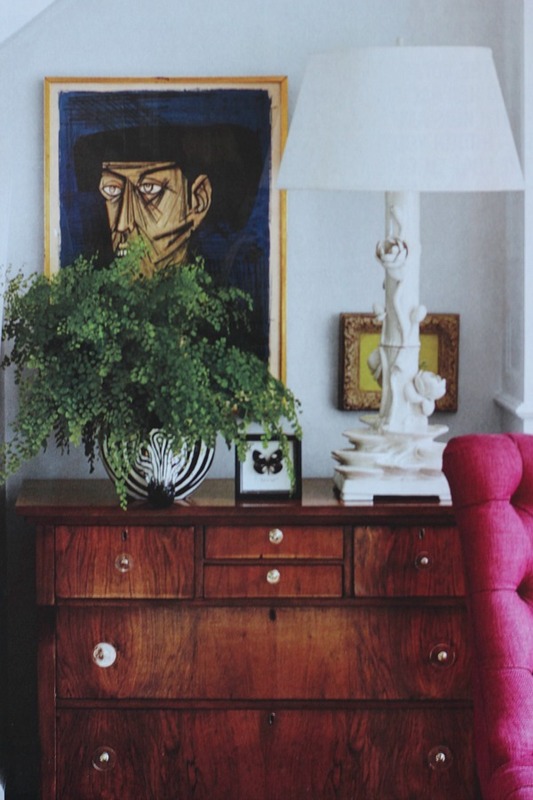 Krista also mentions in the article how she's always on the lookout for unique vintage lamps... me too! 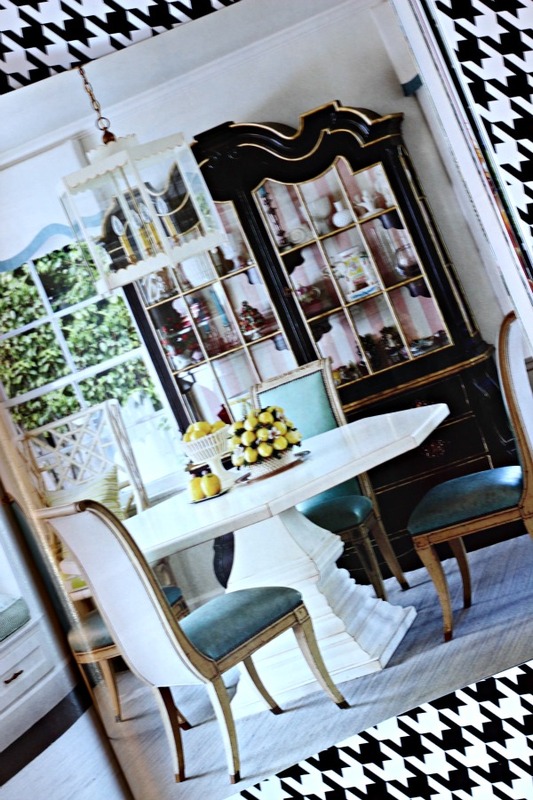 Dining Room Takeaways: First of all, LOVE the shape and presence of the Dorothy Draper china cabinet. I'm not opposed to switching out my china cabinet one of these days, and if I came across something like this I'd do it in a second! My takeaway here- the striped pattern lining the back adds color, lightens the piece up, and adds interest with a bit of playfulness. Love the oversized lantern fixture and the vintage dining chairs, too. 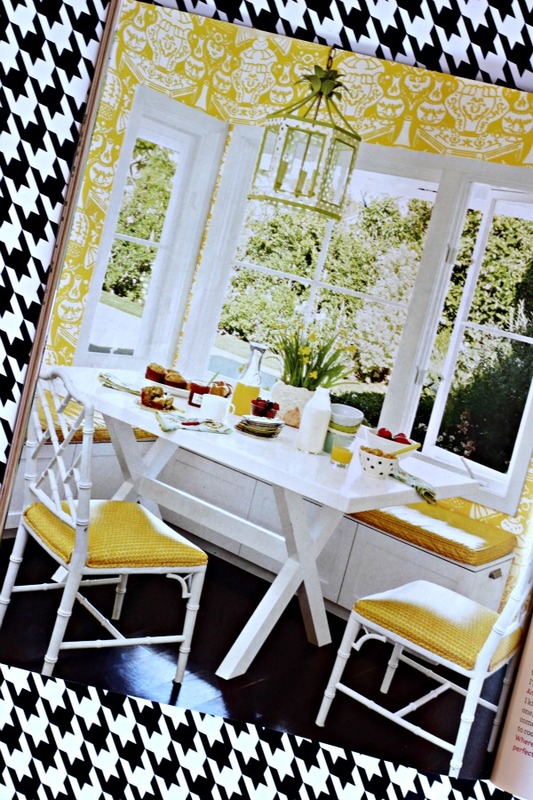 Breakfast Nook Takeaway: I need some gorgeous wallpaper somewhere in my life, like... now. When I stripped the wallpaper off of our kitchen walls, I textured them lightly before painting. Starting to regret that decision. Our powder bath is just about my only option for wallpaper, and someday a makeover there will come... with a bold colored paper for sure! Desk Nook Takeaway: One of these days I'll also find an exquisite gold framed mirror (my second-hand wish list is looooong!). Some day. The basket for storage underneath adds some whimsy and keeps the space from feeling TOO sophisticated. I've wanted to DIY a pom pom basket like that forever but haven't come across just the right basket that I had in mind. My friend Jen beat me to it and made some really cute ones, though! Patio Takeaways: Ahhhh. This space just could not be more fabulous! 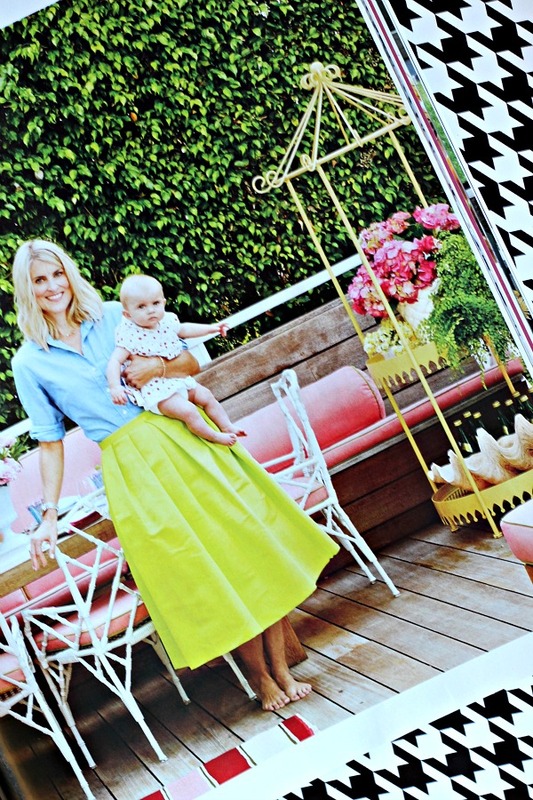 The colors, the mix of furnishings, the flowers, the landscape, her skirt... yes please! The variety of different bouquets in different vases down the center of the table is a cute idea. I really like this free standing iron piece for storage. We don't have a lot of wall space on our new patio that would accommodate a buffet like I might like to have out there, but something like this could go almost anywhere and would be handy for serving. There are a couple of bedrooms that I didn't included here, but you can see more of this house tour here, and read House Beautiful's full interview with Krista Ewart here. What's your favorite takeaway? You're so right, Libbi. I feel like I could walk in and feel right at home, too! Exactly how I want my home to feel. 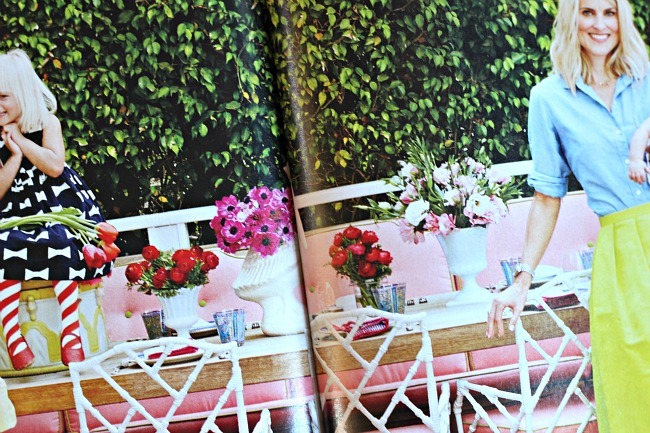 I love that bookcase styling Jennifer. I need more large books to do that with! Such a pretty home and cute family too! I love this home! Not sure how she does it with 3 children and one being small. :) There's a lot to see but it's not heavily decorated or tons of stuff on tables, etc. Feels open and airy I think. 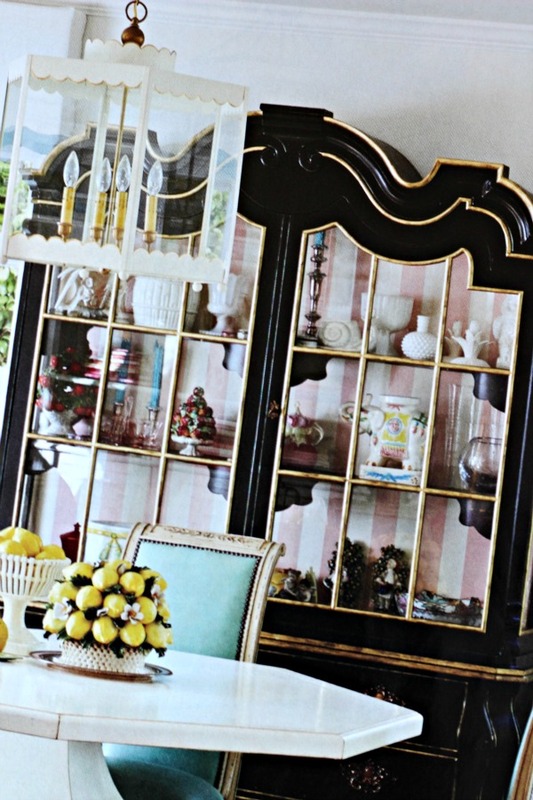 Love those fuchsia chairs, the gorgeous china cabinet and the zebras! :) The outside area is just perfect.